Seeing as I’m *not supposed* to eat sweet potatoes – but hey, a few sweet potato fries shouldn’t present too much of a challenge for my gut, should they? – potatoes are a very good substitute. High in potassium (good for your heart and to maintain a healthy blood pressure) and full of vitamin B6 (good for your skin). A side note on sweet potatoes… supposedly yams are okay? I honestly couldn’t tell the difference between them unless they were labelled very clearly and they’re always next to each other in the produce section and potentially mixed together. The following serves 8-10 people as part of the main course. 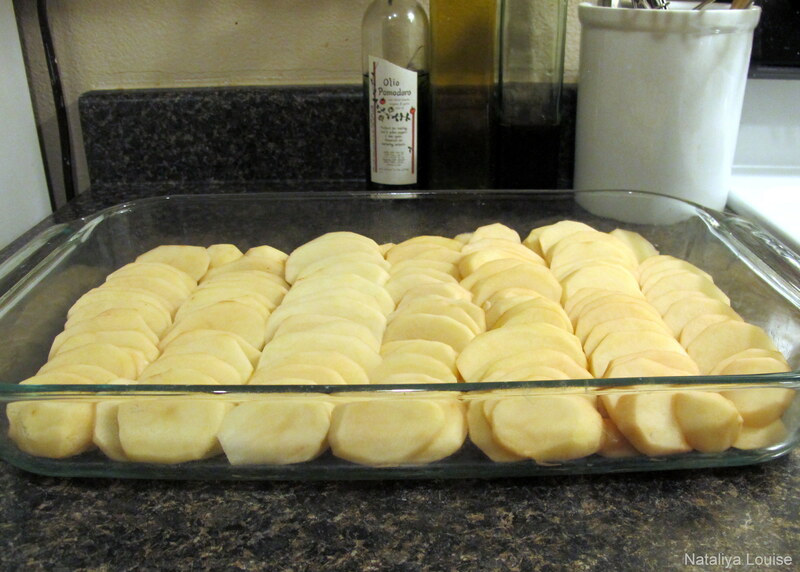 Peel and slice your taters so that they are approx. 5 mm thick. You want them thin enough to not be chewy but not so thin that they dissolve while cooking. 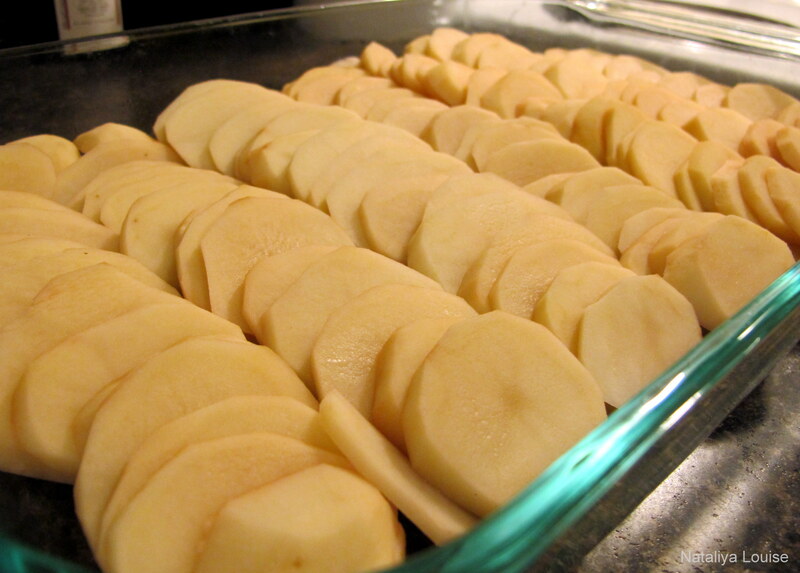 Lightly grease a casserole dish and layer your potatoes out however you would like. The prettier the design, the better. I made a potato flower once but sadly we never got a photo. Leave the potatoes to the side while you make the sauce. Bring the cream, milk, salt and pepper slowly to the boil. This just means that it should start to foam a little, not bubble wildly like water does. Let it simmer for 1-2 minutes. Remove the pot from the heat and let it cool down before stirring through the garlic infused oil and pouring it over the arranged potatoes. 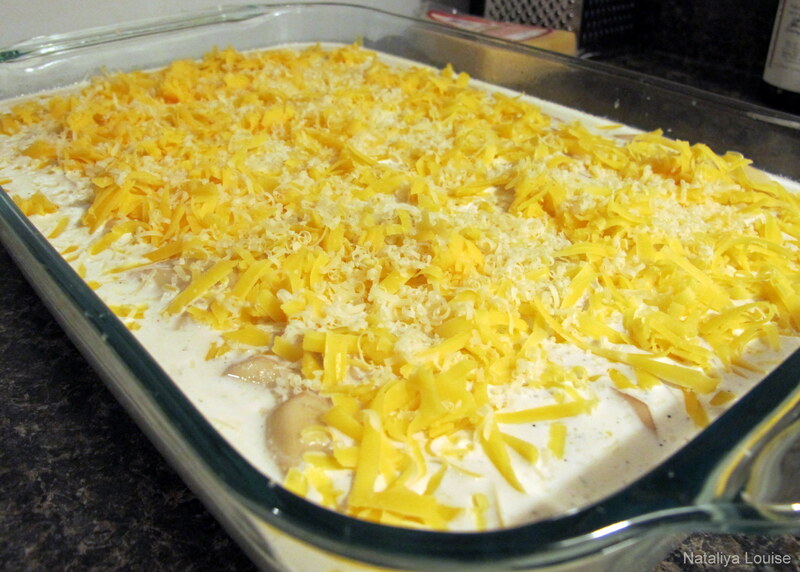 Sprinkle the cheese evenly over the dish. From here you can do one of two things; cook it straight away or cover it with foil and leave it to cook the next day. This is what we normally do when we have people over for dinner because it can be made a day ahead, saving time the next night. And anything that can save us time and space (this is great for stacking in the fridge) is fine by me. When you do decide to cook it, preheat oven to 350 F/180 C and cook it uncovered for at least one hour, 70 to 80 minutes would be best. 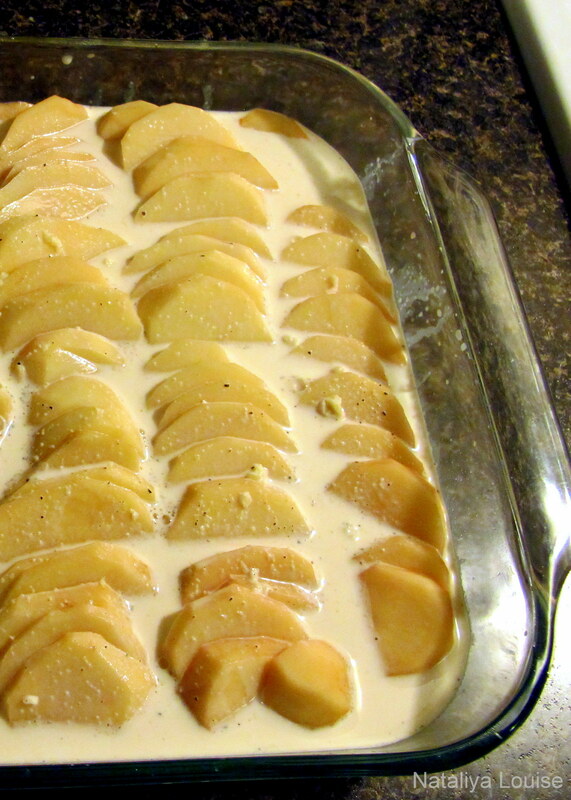 This allows it to brown quite nicely and for the liquid to reduce into a thick, creamy sauce. 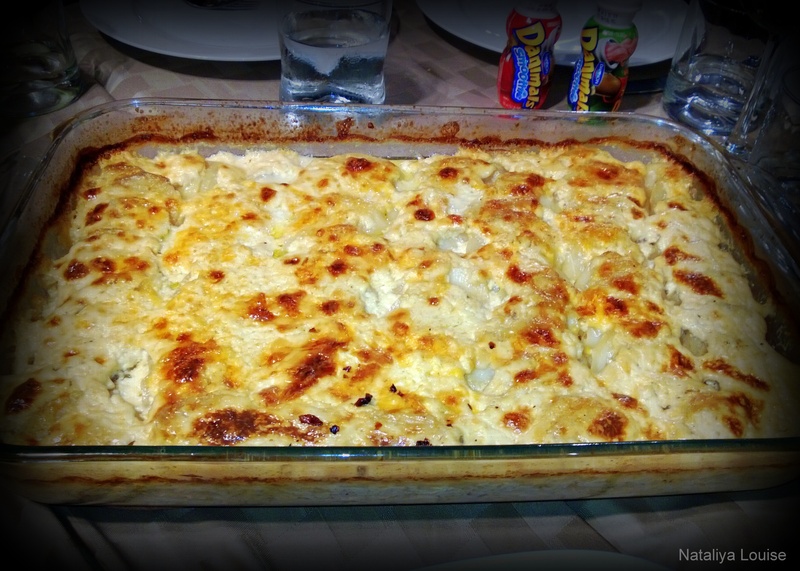 It really is the best scalloped potatoes I’ve ever had. Try it and you’ll see! As for variations, I think you could dice and fry some bacon in the pot you heat the sauce in before you add the milk, cream, garlic and so on. You could also use some fresh rosemary or thyme in the sauce. At least, that’s what I’m planning on doing next time; and there will most definitely be a next time. This entry was posted in Dinner / Mains, Entrees, Appetisers and Sides, Vegetarian or Vegan Entrees or Sides, Vegetarian or Vegan Mains and tagged cheddar cheese, cheese, comfort food, from scratch, fructose friendly, fructose malabsorption, gluten free, home-cooked, homemade, low fructose, Parmesan cheese, potato bake, potato gratin, potatoes, scalloped potatoes, vegetarian. Bookmark the permalink. Hi! Made this a few weeks ago, turned about deliciously rich and creamy. I used malt free soy milk, lactose free shredded cheese (Liddels brand). I was heaps nervous that the milk and cream mixture would curdle over the heat and was surprised it didn’t! Served it with a salad =) Thank you for the recipe! I’m so glad this worked out with soy milk – I’ve used LF dairy milk and cream before but never soy. 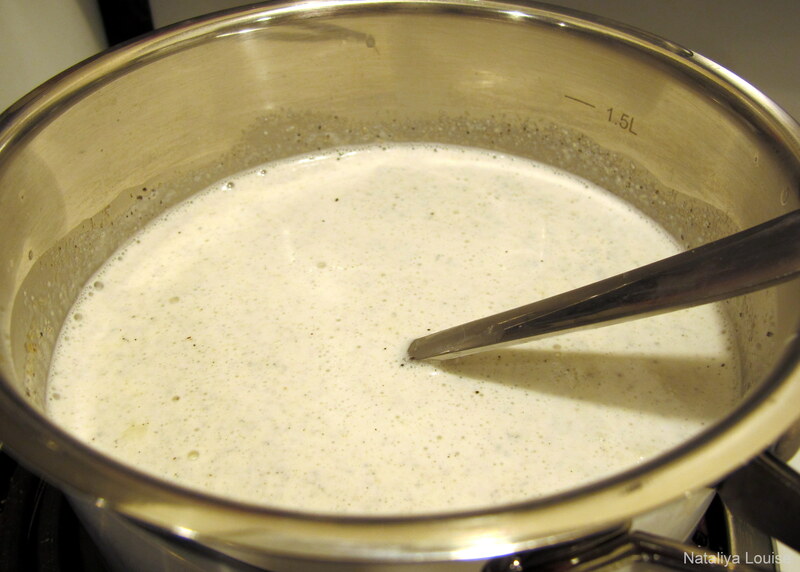 The milk (at least dairy, I’ve never cooked with soy milk) shouldn’t curdle if you don’t go above a medium heat – boiling milk doesn’t roll like water does, it bubbles/froths at the edges, so that’s a good pointer to look for if you’re heating dairy milk in the future.